Sunday 7 a.m. - 1 a.m.
Monday 7 a.m. - 1 a.m.
Tuesday 7 a.m. - 1 a.m.
Wednesday 7 a.m. - 1 a.m.
Thursday 7 a.m. - 1 a.m.
Friday 7 a.m. - 1 a.m.
Saturday 7 a.m. - 1 a.m.
See also Boerejongens Centre and Bij. This is the best coffeeshop I know when it comes down to getting value for your money. With a menu as great as the best shops in the centre, except it's generally €2, and sometimes even €4 a gram cheaper here. Menu is especially similar to Dampkring. Some examples: Big Buddha Cheese €9, L.A. 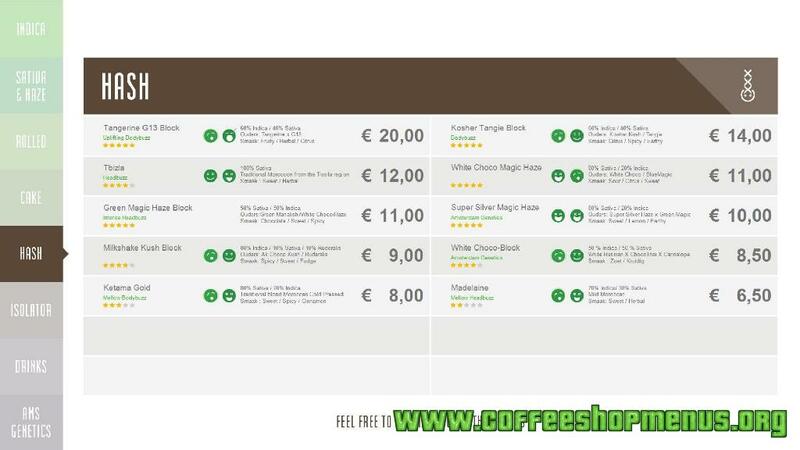 Confidential €9,50, Super Silver Haze €9,50, White Russian €7, Amnesia €8, and their amazing White Choco at €7. It's take-away only though, so you'll have to smoke it somewhere else. A bit hard to find when using public transport, but one of the few shops in Amsterdam that's accessible by car (you can park for free in front of the door). Q from Amsterdam. Sent 29 Dec 2010. Not many people know this place but this is really one of the best coffeeshops there is! Cheap, quality, everything! I would recommend every haze they have! Christian from Spain. Sent 18 Aug 2010. I think in this coffeeshop they have some of the best weeds in Amsterdam, but probably they will give you less weed and hash than you were expecting. If I order one gram, they give 0.86 grams. It's a big difference. Matt from USA. Sent 16 Jan 2008. They advertised in High Times. It's a local place at the far end of the Vondel Park, I think the 1 and 17 trams are closest. I went on a Sunday afternoon. Although the menu has most things in the 7-8 euro range, they were sold out of many. I tried the Heavenly Haze at 9, it was okay, but like most of the things they had, it was more shake than bud. The sitting area was nice enough. I may have caught them on a bad day, if I was in the area I might try them again, but wouldn't go out of my way just to save a euro or two. George from Greece. Sent 3 Jan 2008. Excellent menu for both hash and weed, Ice joints (isolator) are kickass and the environment is really delicate and enjoyable for a coffee and chat. Staff is friendly and they will happily answer all your questions. Really a surprise to find such a coffeeshop in my neighborhood. Stan Da Man from Amsterdam. Sent 16 Oct 2007. 1 euro cheaper than in the city.